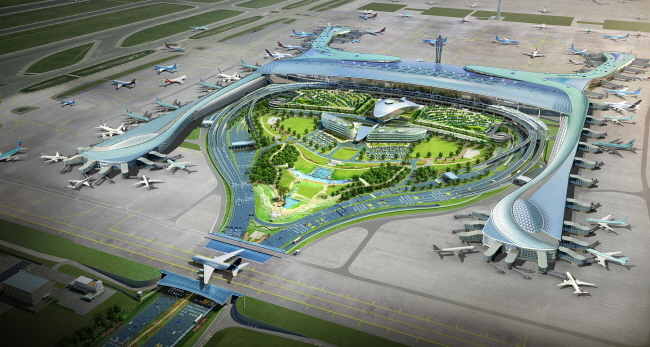 Incheon International Airport Passenger Terminal 2 will officially open on January 18, 2018. The airport will be able to accommodate up to 18 million additional travelers with the opening of Terminal 2. In comparison to the current Terminal 1, Terminal 2 will allow departing travelers to check-in faster with its increased number of kiosks and self-bag drop services. Also, the distance between Terminal 2 and its transportation center is shorter than that of Terminal 1 so that visitors can have convenient access to transportation. A shuttle bus will depart every 5 minutes from each terminal, serving as the main transportation between Terminal 1 and Terminal 2. The current Airport Railroad and airport limousine buses will also extend their routes to include Terminal 2, stopping by at Terminal 1 on the way. Not only will the food court and restaurants serving international cuisines please the travelers at Terminal 2, exhibition halls and an observatory deck offering a view of the departure terminal and airport runways will easily help pass time at the airport. Take note that Korean Air, Delta, Air France, and KLM Royal Dutch Airlines will be the only airlines offering services at Terminal 2 upon its opening. Departing travelers are advised to double check their airlines and flight number before heading to the airport as passengers who are not traveling with the aforementioned airlines will not be able to check-in at Terminal 2.